Happy New Year! Getting my craft on is the perfect way to start a new year. Start your New Year off right and take the TGIF Challenge! Did you know that anyone can play? You do not need to have a blog. You can snap a pic and share it on Facebook, Pinterest, Twitter, Instagram, Flickr ... did I forget any? For complete details visit the TGIF site. This week is a special week at TGIF. 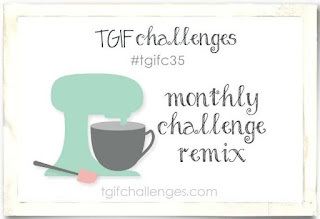 There are two challenges being issued ... one to wrap up December (#TGIFC35) and one to kick start 2016 (#TGIFC36). You need to visit TGIF to see both of the challenges and all of the creations from the design team.